Last sunday EFE news agency, the leading one in Spanish speaking world, distributed an article about Panoramio that appeared in several newspapers and websites around the World; CNN+, La Vanguardia, Terra and some other ones). As a result traffic from Spain, Mexico, Argentina, Chile and other Spanish speaking countries boosted. Yesterday I was interviewed about Panoramio for Canal Sur Radio, but the best thing was getting an e-mail from a friend from Mexico city. Like every morning he was hearing his favourite radio program in Universal Stereo (92.1 FM) when they started speaking about Panoramio for some minutes. He made my day! Just few hours ago we released a new homepage for Panoramio. José Florido, a very talented designer from Málaga has helped us very much with this new design. I believe the new homepage looks much better. The code is standard compliant. The new design explains much better what Panoramio does and its features. Now there is a mini-panoramio in the homepage that rotates, so you have the chance to take a close look at amazing places like Cape of Good Hope, Teotihuacan, Svalbard and many others. The search engine is now in the homepage so there is a fast way to go anywhere in the world. Also there is more clear access to the World Map and to Panoramio's KML feed for Google Earth. Apart from the homepage some other pages have been redesigned; help, about and team. Last Tuesday, October the 3rd, was Panoramio's first birthday. The present Panoramio got was a new powerful server with two dual-core Opterons, 4 GB of RAM and other nice features. Thanks very much to Mickey Everts from Neopolitan for the help with the migration to the new server and to John Hanke Director of Google Earth / Maps for his invaluable support, mil gracias John! It was the right moment to move, the old server was smoking with traffic peaks. With the new server Panoramio's speed increased very much. The overall user experience is much better now, specially while browsing the map and watching Panoramio's KML feed. Traffic increased around 10% with the new server. There are more good news. The day before the first birthday Panoramio reached the magic number of 50.000 photos (almost 55.000 right now). Now you can find a photo of almost any main city or known place in the World from North Pole to Antarctica. Growing at a monthly rate over 20%, Panoramio's future looks nice. We are enjoying working on it very much. This first year we have learnt a lot about photos and maps from Panoramio's users, their requests, behaviour, comments and questions. This knowledge is going to make possible the next developments. Stay tuned, many changes are comming. Last Thursday Joaquín was in Madrid to get an Honorable Mention for Panoramio at Google Maps Spain's contest, organized for Ojo Buscador and sponsored for Google Spain. There were 52 mash-ups running for the prize and I believe it was very difficult for the members of the jury, Matthew "Chewy" Trewhella, from Google, Mike Pegg from Google Maps Mania and Javier Casares from Ojobuscador, to choose. Wikiloc got the first prize and I believe it fully deserved it. 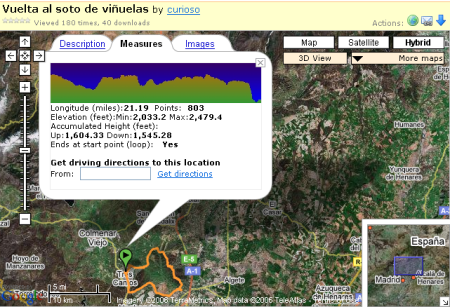 At Wikiloc you can publish and share your GPS routes and it's available in English, Spanish and Catalan. Wikiloc includes a lot of nice features, route profile, images, alternative maps, KML for Google Earth, etc. Using it you will realize that Wikiloc's developer, Jordi L. Ramot, loves his project, it's full of nice details. Tagzania was also there, a wonderful project that is working very good and with a huge community behind. It was one of the first mash-ups launched in july 2006 and maybe the example that encouraged so many developers in Spain to start working with Google Maps API.